I’d like to share another recipe with you that we make frequently during the summer when our garden is in high production mode. We made this the other night with the last of our leeks, which is extra sad since commercial leeks are so darn expensive we rarely buy them. 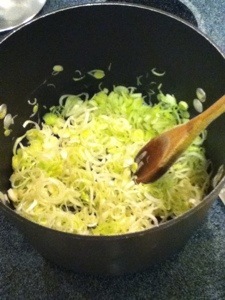 First, thinly slice a lot of leeks, white and light green parts only. The original recipe calls for 2 cups of leeks. We put in more than that, simply because a) we love the leek-y flavor and b) this is the only thing we make with leeks and they’ve gotta get used up somehow. 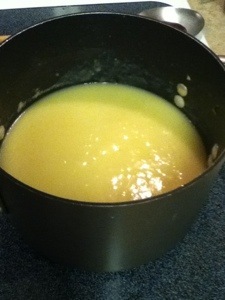 In a large stockpot, melt 2 Tbsp butter over medium heat. Add the leeks and sauté until soft, about 10 minutes. 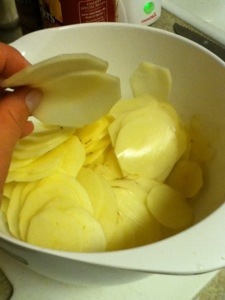 While the leeks are cooking, peel and slice the potatoes. I slice them on the thinnest setting to speed up cooking time. 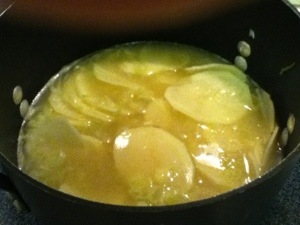 Once the leeks are soft, add the potatoes, broth, and water to the stockpot. We always use Pacific Low-Sodium broth. 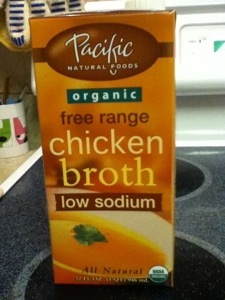 It’s got the lowest sodium of all the broths we’ve tried and we like the whole “free-range, organic” thing. Then, purée the soup. You can either do it in batches in a blender or in the pot with an immersion blender (which is what we do; it makes it so easy and clean up’s a breeze!). And that’s it! Super easy, no? Serve it with some good crusty bread and you’re set. The DreadBrewer and I have been known to eat the entire pot just the two of us, but our appetites are somewhat legendary. More reasonable people could probably get 4 servings, particularly if you add a salad or something. And for those of you on Weight Watchers with me, the entire batch is 27 points plus. So you can eat half the pot with relative impunity. This entry was posted in Gardening, Home Life and tagged Recipes by BrewsterMama. Bookmark the permalink.